Amazon EU market, being the second largest Amazon regional market in the world besides the North American market, has undoubtedly a lot of potential and opportunities for new and experienced online sellers alike. Due to the integration in Amazon Seller Central, European sellers can easily access to five EU marketplaces: Amazon UK, FR, DE, ES and IT with one login. The popularity of EU market grows as more and more sellers join Amazon to start their own online business. BQool has thus conducted an analysis with some interesting findings and Marketplace Pulse’s research of the EU market in hope to offer our sellers some useful insights about Amazon EU market. Read on and learn more about the strength of each EU marketplace and why you should start your own EU amazon store! 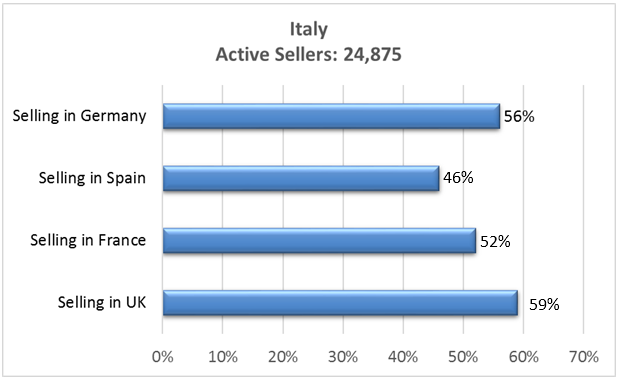 Amazon UK is the most popular marketplace among European merchants. 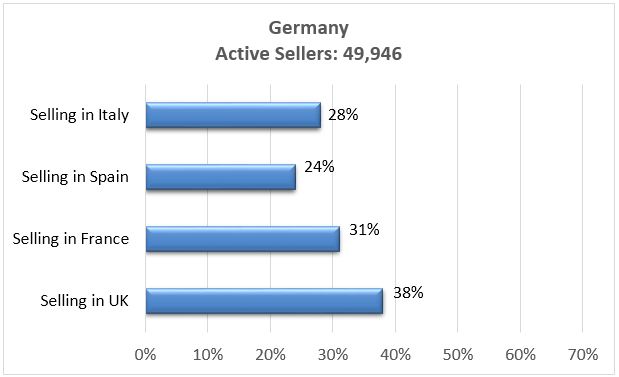 According to a research done by Marketplace Pulse, there are 60,893 active sellers in Amazon UK while the second most popular marketplace, Germany, holds 49,946 active sellers. By definition, “active seller” means that the seller has sold at least one item in that marketplace in one month. 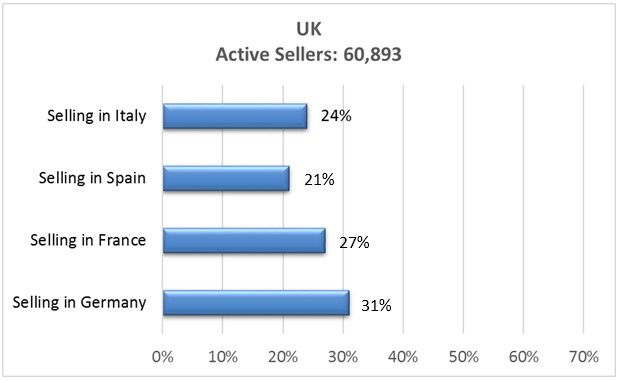 Even though UK has highest seller numbers, a large portion of the crowd also sells on other EU marketplaces. For example, there are 19,508 active sellers in Amazon ES and 66% of them also sell on Amazon UK . The top contributing factor for the popularity of the UK market is the English language itself, a language that is widely-spoken in numerous parts of the world. For most US sellers and international sellers with good proficiency in English who plan to expand their business to European marketplaces, Amazon UK would be their first choice as the language is a clear advantage. Despite the fact that Amazon UK owns the biggest number of merchants in Europe, interesting enough, it is not the most lucrative marketplace for Amazon. Germany, however, takes the crown of being the biggest market in Europe and the second biggest marketplace in the world after the US. In 2016, it had contributed 10.4 percent of the company’s annual revenue and almost reached a 20% growth . 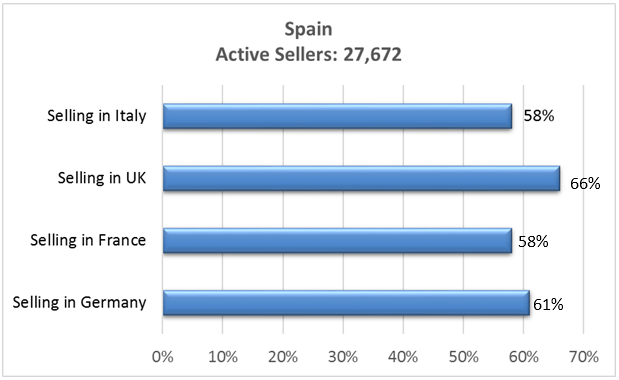 The research also shows that there are 6600 active merchants selling on all 5 EU marketplaces. That is to say, 10% of Amazon UK sellers have sold at least one item in a month on each EU marketplace. The actual number of sellers who have opened Amazon stores in these 5 marketplaces is expected be higher. 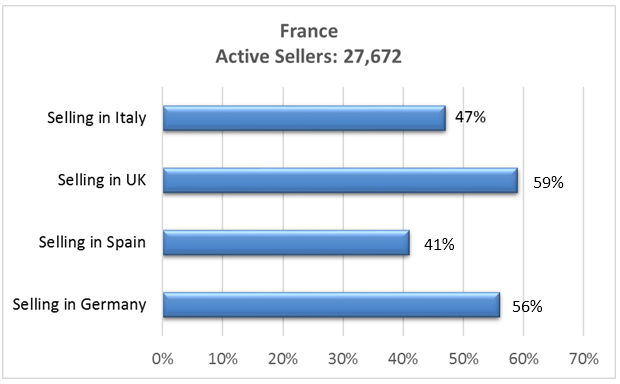 BQool’s research found that 24.8% of sellers who are in Amazon UK also sell in other 4 EU marketplaces. 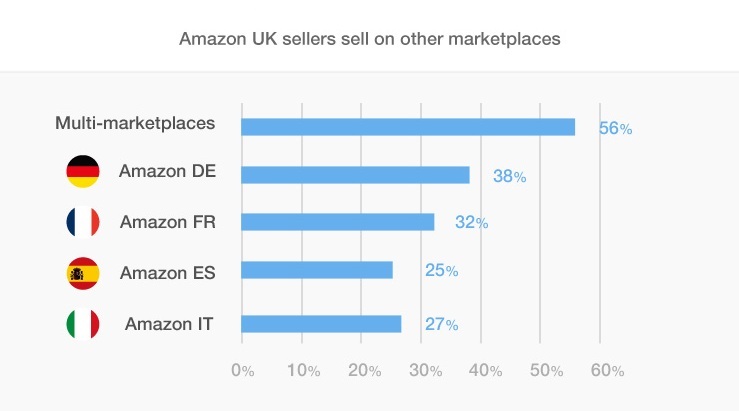 Therefore, we believe that there should be more than 10% of Amazon UK sellers sell on all 5 EU marketplaces. Although Amazon FR, ES and IT are relatively small markets, half of their sellers are selling on multiple marketplaces. On the contrary, less Amazon UK and DE sellers sell on other marketplaces. 50% of Amazon FR, ES and IT sellers sell on multiple marketplaces. The phenomenon that EU sellers tend to sell in more than one marketplace could be partially contributed to Amazon’s fulfillment network in Europe. 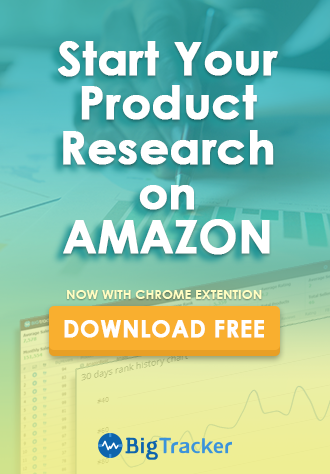 Pan-European FBA enables sellers to ship their inventory to Amazon’s warehouses in the UK, Germany, France, Italy, Spain, Czech Republic, Poland and Slovakia. When an order is placed, sellers don’t have to ship the product by themselves as Amazon will dispatch it from their closest warehouse. Amazon recruited 10,000 new workers in 2016 and is planning to create 15,000 jobs this year. Most of these new jobs are to support the expansion of Amazon’s fulfillment network since many new warehouses are currently being built in several countries . Amazon EU is still relatively new and unsaturated yet compared to Amazon US. Hope this information will help you to have deeper understanding of the market. 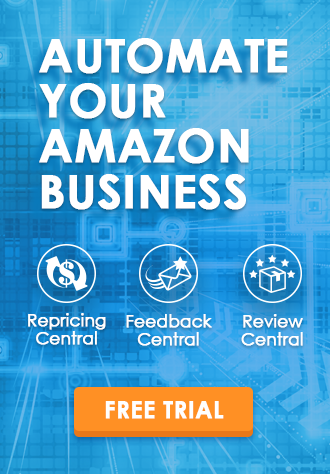 If you are already selling on Amazon EU and want to send out EU VAT invoices to your buyers, our Feedback Central can achieve that for you! Please check EU VAT Invoice Generator to see how it works.